One day, the Yueyang Clan’s leader went out night-hunting with a few family members for about half a month. In the middle of the night, without any warning, they received the bad news and immediately hurried back. After the mourning, they only found out that someone purposely destroyed their protective array and let in a group of powerful evil spirits. Other than that, they knew nothing. In most cases, only few people knew about the tragedies that happened in smaller clans, but the circumstances back then were different. The Sunshot Campaign finished long ago, while the siege at Luanzang Hill only just ended. On the surface, the situation seemed rather stable. With the sudden disclosure of this event, the entire cultivation world was bubbling with discussion, some even exaggerating that it was the revenge of the revived YiLing Patriarch, Wei WuXian. However, there wasn’t any evidence, so it had been impossible to find the killer. Of course, Xiao XingChen didn’t sit back and do nothing. He volunteered to be responsible for the matter and find out the truth for Chang Ping. After a month, the murderer was finally discovered. The murderer’s name was Xue Yang. Xue Yang was even younger than Xiao XingChen, nothing more than just a boy. Despite this, he definitely didn’t tone down on his cruelty just because he was young. Ever since the age of fifteen, he had been a delinquent in the area of Kuizhou, known far and wide for his radiant smile, inhumane means, and merciless personality. Everyone’s expressions changed whenever he was brought up in a conversation. When he was a child dwelling in the streets, it was said that he developed a hatred that lasted for years toward Chang Ping’s father. He committed this crime in vengeance and for some other reasons. After Xiao XingChen found out the truth, he went across three provinces and Xue Yang was still happily picking fights with others. Taking advantage of the Discussion Conference that was happening at the Jinling Tower of the LanlingJin Sect’s residence, when the most prominent sects met up and discussed cultivation methods, Xiao XingChen brought him over, explained the situation, and demanded severe punishment. With his straightforward list of evidence, most sects didn’t have any objections, except for one—the LanlingJin Sect. Wei WuXian’s heart immediately skipped a beat. The phrase was definitely not a stranger to him. On the contrary, nobody was more familiar to those three words than him. Among all of the spiritual weapons he had forged when he was still alive, this was the scariest and most famous one. When Wei WuXian first created it, he didn’t think too much about it. Single-handedly controlling corpses and spirits, of course he’d occasionally grow tired. Remembering a rare piece of iron ore he happened to have seen in a beast’s stomach, he used it to cast a Tiger Seal. But, after the Tiger Seal had been created, Wei WuXian only used it once before finding out that it did more harm than good. The Stygian Tiger Seal’s powers were considerably greater than what he had imagined. He originally wanted to use it to assist him, but its powers were almost exceeding him, its creator. Moreover, it didn’t settle on one single master. This meant that if someone got hold of it, no matter who they were, whether they were good or bad, friend or foe, they were able to use it. After the seal had been forged, it wasn’t that Wei WuXian never thought about destroying it, but since the seal was created with much difficulty, it would’ve been extremely hard to destroy, costing him both time and energy. And, back then, he had already vaguely understood that he wasn’t in a good situation and would be hated by everyone sooner or later. With a weapon as appalling as the Stygian Tiger Seal, others didn’t dare to act rashly, so he temporarily kept it. He separated the seal into two halves, making it so that they could only be of use when they were put together, and never used without careful consideration. He had only used it two times before, and both times caused great bloodshed. The first time was during the Sunshot Campaign. After using it for the second time, he finally decided to destroy one half of the seal. Before he could completely destroy the other half, the siege at Luanzang Hill happened, and it had since then been beyond his capabilities. Toward his own creation, Wei WuXian was confident to say that even if the sect that got hold of it, made a temple for it, and offered it incense every single day, the remaining half of the Tiger Seal was just a piece of scrap iron. However, Lan WangJi told him something shocking—it appeared that Xue Yang could rebuild the other half of the seal! Although Xue Yang was young, he was also quite clever, a bizarre eccentric. The LanlingJin Sect discovered that he could use the remaining half of the seal to roughly piece together the other half. Even though the recreated version wasn’t as powerful and couldn’t be used for as long, it could already result in terrible catastrophes. Perhaps, Xue Yang destroying the Chang Clan wasn’t entirely to avenge what they did to him when he was young. He might have been testing on this clan of live humans what exactly was the extent of the restored Stygian Tiger Seal’s powers! Returning to the original thread of conversation, they continued about what happened at the Jinling Tower. Although the LanlingJin Sect was determined on protecting Xue Yang, Xiao XingChen didn’t waver either. As the stalemate continued, they finally startled ChiFeng-Zun, Nie MingJue, who didn’t intend on participating in the Discussion Conference. He hurried over to Jinling Tower from far away. In spite of Nie MingJue being a junior to Jin GuangShan, he conducted himself in a strict manner and refused to tolerate Xue Yang no matter what. With an angry lecture, Jin GuangShan was left with no words and a great deal of embarrassment. Nie MingJue, as the irritable person he was, unsheathed his saber on the spot with the intention of killing Xue Yang. Even when his sworn younger brother LianFang-Zun, Jin GuangYao, attempted to ease the situation, he ordered him to leave. After a harsh scolding, Jin GuangYao hid behind Lan XiChen, not daring to say anything else. In the end, the LanlingJin Sect could only give in. At this point, Wei WuXian knew that the “wait and see” would make Xiao XingChen pay an agonizing price. The LanlingJin Sect was indeed the sect with the thickest face. Although, on Jinling Tower, it promised in front of all of the sects that Xue Yang would be executed, when it left Nie MingJue’s sight, it immediately shut Xue Yang into the dungeons and changed the original decision to a life sentence. Hearing about the matter, Nie MingJue was enraged and pressed on them again. The LanlingJin Sect rambled about, refusing to give him Xue Yang no matter how hard he tried. All of the other sects watched them from the sidelines, but, shortly afterward, Nie MingJue passed away from Qi deviation. He cultivated at a faster speed than any other past leader of the Nie Sect, and also died sooner than any of them. Now that the person who was most difficult to deal with was gone, the LanlingJin Sect became more and more reckless and started to think of worse ideas. Jin GuangShan started to try as hard as he could to get Xue Yang out of the dungeons so that he could continue to restore and examine the Stygian Tiger Seal. However, this wasn’t exactly something to be proud of. It was impossible for him to save the murderer of an entire clan from the dungeons without a valid reason. So, they turned their attention to Chang Ping. From coercion to harassment, in the end, the LanlingJin Sect finally pressured Chang Ping into correcting his words, invalidating all of his past speeches. He announced that the wiping out of the Chang Clan had nothing to do with Xue Yang. And thus, the tiger had been set free back to the mountains. If he were Chang Ping, he wouldn’t have cared how prominent or powerful the LanlingJin Sect was, or how much glory the road ahead offered him, and he wouldn’t have let the matter go. Instead, he would’ve went to the dungeons on his own, cut Xue Yang up so that he was nothing more than a puddle of flesh on the ground, and summoned his soul back to repeat the process to the point that he regretted ever being born in this world. But, not everyone was like him, preferring to perish together with his enemy. Some of the Chang Clan’s people were still alive. Chang Ping was also still young, single, and childless, having just took his first few steps on the path of cultivation. No matter if he was threatened with the lives of his remaining family members or his own future and cultivation, he had to think carefully. Of course, he wasn’t Chang Ping himself. He couldn’t be angered or worried in place of Chang Ping, and he couldn’t bear Chang Ping’s share of mental and physical torment. After Xue Yang had been released, he started to take revenge again. However, this time, the revenge wasn’t on Xiao XingChen himself. Xiao XingChen left the mountain alone and had no family. He only had a friend that he met afterward, named Song Lan. Song Lan was also a cultivator of the time. He was a righteous, determined person and had a fair amount of appraisal. Both of them wanted to build a sect that valued common ideals instead of blood ties, which made them the closest and most like-minded of friends. The people of the time described them as such—Xiao XingChen the bright moon and gentle breeze; Song ZiChen the distant snow and cold frost. Xue Yang put his hands to this side. Repeating his past technique, he wiped out the Baixue Temple where Song Lan grew up and studied at, and used poison to blind Song Lan’s eyes. This time, with his experience of wiping out a sect, he made sure to not leave any evidence. Although everybody knew that he was the one who did it, what would be the use of that? There wasn’t any evidence. And, with Jin GuangShan’s deliberate protection and the death of the violent ChiFeng-Zun, nobody could do anything about him. Wei WuXian found this a bit strange. Although Lan WangJi looked as if he didn’t care about anything, from Wei WuXian’s past experiences with him, he absolutely couldn’t stand wrongdoings, possibly even more than Nie HuaiSang’s brother. Back then, the LanlingJin Sect had some dishonest ways of doing things, and Lan WangJi never bothered to be subtle about them. Even until now, he always refused to go to their sect’s Discussion Conferences. If two cruel massacres happened, the news would’ve probably spread over the entire cultivational world and Lan WangJi definitely wouldn’t have turned a blind eye to them. Why did he not go and give Xue Yang what he deserved? Just as he was about to ask, he remembered the scars that the discipline whip gave him. One lash of the discipline whip would already be quite severe. If Lan WangJi made some sort of a grave mistake and received so many lashes, he had probably been grounded for a few years. It was likely that he was either going through his punishment or waiting for his wounds to heal during the years when the incidents happened. No wonder he said had only “heard” about what happened. What happened afterward was certainly a tragic ending. When he left the mountain and his teacher, Xiao XingChen vowed that he would never go back again. He was a man of his words, but since Song Lan was not only blind but also badly injured, he broke his vow and carried Song Lan back to BaoShan SanRen’s residence, asking her to save his friend. For the sake that they were once teacher and pupil, BaoShan SanRen agreed. Thus, Xiao XingChen left the mountain once more, and he was never seen again. A year later, Song Lan also left the mountain. To everyone’s surprise, his eyes, which were completely blinded, saw light again. However, it wasn’t that BaoShan SanRen’s medical skills created a miracle, but that Xiao XingChen… dug his own eyes out and gave them to Song Lan, who was only involved in this because of him. Song Lan originally wanted to seek revenge on Xue Yang. At this time, Jin GuangShan had already passed away. Jin GuangYao took over the LanlingJin Sect and the position of Sect Leader. To show that things were going to be different, the first thing he did after he came to power was to get rid of Xue Yang. Aside from never mentioning the Stygian Tiger Seal again, he also made amends to restore the sect’s reputation, suppressing the rumors. Song Lan went to search for his past friend’s whereabouts. At first, people still heard talk about where he traveled to. After some time, he also disappeared. Moreover, the YueyangChang Sect was a small clan that was generally unheard of. And thus, a lot of things gradually faded away. Having finished listening to the long story, Wei WuXian sighed softly. A feeling of regret sprouted inside him, Meeting such an end because of something not related to him at all, it really was… If Xiao XingChen was born a few years earlier or if I died a few years later, things wouldn’t have had to be like this. If I was alive, how would I have not taken part in the matter? How would I have not made friends with such a person? Immediately afterward, he laughed at himself bitterly, I would’ve done something? What could I have done? If I was still alive back then, perhaps the YueyangChang Sect’s case didn’t even need to be investigated before everyone decided that I did it. If the Daozhang Xiao XingChen bumped into me on the streets and I chatted with him, invite him to drink together, it’s likely that he’d hit me with his horsetail whisk, haha. Before Lan WangJi could answer, a series of bangs came from amid the blue-tinted dusk. The noise sounded a lot like slamming on doors, but it wasn’t. The bangs were carried out with force and at a fast pace, without a moment of rest. They sounded somewhat muffled, as if there was something separating them from the outside world. The fifty-or-so people of the YueyangChang Sect were currently lying in their coffins, slamming on their coffin lids from the inside. It was at night they were frightened to death—they madly slammed on the doors, but there wasn’t anyone to let them out. This was the slamming on coffins in the Chang Clan’s cemetery that the liquor shop’s waiter talked about! However, the waiter said that the haunting was ten years ago and stopped long before now. Why would the slamming happen to start again when they came? Without passing any words between them, Wei WuXian and Lan WangJi both softened their breathing, stealthily moving without making a sound. Propping themselves against the pillars of the pailou, they both saw that, in the center of the cemetery, there was a hole amid the tombstones. It was a deep, recently-created hole with piles of dirt surrounding it. Faint noises came from within the hole. Someone was digging out a grave. The two of them held their breaths, attentively waiting for the person in the hole to come out on their own. Before an hour passed, two people hopped up from inside the opened grave. Wei WuXian and Lan WangJi could tell that these were two people only because they had good vision. These two appeared as if they were conjoined twins. One carrying the other on their back, they were tightly connected together. With both of them wearing entirely black clothes, it was extremely hard to tell the two apart. The person that hopped up had long legs and long arms, standing with his back toward them. The one that he carried seemed lifeless, their head and limbs hanging down. This was only natural. Since the person was dug out from a grave, then it must have been dead. Lifeless was what should’ve been expected of it. As he thought, the gravedigger suddenly spun around and saw them. There was a mass of thick, black mist over the man’s face, making it so that nobody could see how their face and features looked! Wei WuXian knew that he must have casted some sort of strange spell to block his face. Lan WangJi had already unsheathed Bichen, darted into the cemetery, and started the fight. The gravedigger’s reaction was extremely quick. Seeing the attack of Bichen’s blue sword glare, he made a hand seal and also summoned a sword glare. The sword glare was the same as his face, surrounded by dense mist, and made it so that it was impossible to see what its color and style was. With a corpse on his back, the gravedigger fought in a strange way. The two sword glares clashed a few times. Lan WangJi summoned Bichen back and held it in his hand, a layer of frost climbing over his face. Wei WuXian knew why his face suddenly turned cold. It was because, during the fight, even an outsider like him could tell that the gravedigger was extremely familiar with Lan WangJi’s sword moves! Lan WangJi said nothing. Bichen’s attacks were deeper and deeper, attacking with tremendous force. The gravedigger fell back a few times. As if he knew that, with a dead person on his back, he wouldn’t be able to win against Lan WangJi and, if they continued to fight, he’d be captured alive, he suddenly fished out a dark-blue talisman from his waist. This type of talisman could instantly transport someone to hundreds of miles away, but it also expended a great amount of spiritual energy. It would take a long time for the user to regain their energy. Those with spiritual energy that wasn’t powerful enough wouldn’t be able to use them. Thus, although they were of very high quality, it was rare for anybody to use them. Seeing that he was about to escape, Wei WuXian hurriedly clapped twice, got down on one knee, and slammed his fist on the ground. The strength of his punch passed through layers of dirt, reached the depths of the soil, and penetrated the thick coffin lids, provoking the corpses trapped inside. With crackling noises, four bloodied arms shot up from the ground, grabbing both of the gravedigger’s legs! The gravedigger seemed as if he didn’t care at all. He poured his spiritual energy toward the bottom of his legs, blasting the four corpse hands away. Wei WuXian pulled out his bamboo flute. A shrill, piercing melody ripped open the curtain of darkness that had fallen. Two human heads emerged from the ground along with their bodies, climbing upward from the gravedigger’s legs and winding around his body as if they were snakes. Opening their mouths, they prepared to bite down at his neck and arms. The gravedigger snorted with disdain, as if he was saying “what a petty trick”, and sent spiritual energy throughout his body. Yet, this time, only after he released his energy did he realize that he had been fooled. He sent the corpse that he carried on his back flying off as well! Wei WuXian laughed uncontrollably as he smacked the tombstone, while Lan WangJi caught the flaccid corpse with one hand and attacked with Bichen using the other. Seeing that what he had just dug out had been snatched away, that he couldn’t even win solo against Lan WangJi, let alone the mischief of another person, he didn’t dare to stay any longer. He hurling the Transportation Talisman on the ground. After a loud noise, blue flames surged up toward his sky. His figure disappeared into the fire. As he glanced at it, he was somewhat surprised. The head of the corpse had already been split open. From within the cut, there wasn’t any blood or brains leaking out, but wads of blackened cotton. Wei WuXian felt the corpse from head to toe and discovered that, aside from its drooping limbs, only its chest and abdomen felt firm and real. After he tore off the clothes, as he expected, he found that only the torso was real. All of the other body parts were fake. The head and limbs made from cotton were to “deceive” the torso, so that it still thought it was attached to its owner’s body. Seeing from the skin tone and the part where the left shoulder cut off, this must be the torso of the dear friend. The gravedigger was here for this. It’d be inconvenient for him to be more specific, such as Lan XiChen or Lan QiRen. Wei WuXian was quite confident in Lan WangJi’s answer. To him, Lan WangJi wasn’t the kind of person who’d hide or run away from the truth. If he denied it, that meant it must have been wrong. He didn’t like to lie, either. In Wei WuXian’s opinion, if someone asked Lan WangJi to lie, he’d rather silence himself and not talk at all. Thus, Wei WuXian immediately excluded the possibility of the gravedigger being these two. Lan WangJi put the torso into another double-layered Qiankun Pouch and put it away properly. The two walked around for a while and wandered back to the street of the liquor shop. Wei WuXian laughed as he answered. With Lan WangJi, he walked back to the table they sat during the day. Lan WangJi continued the explanation with simple, direct words. Xue Yang, Xiao XingChen, and Song Lan left one by one. Some disappearing, some passing away. Quite a few years after the incident passed, one day, Chang Ping and the remainder of his clan’s members died overnight due to lingchi. Moreover, Chang Ping’s eyes were dug out. This time, nobody could find out who the murderer was. After all, everyone apart of it had vanished. However, there was one thing that could be determined. From the wounds, it could be verified that the sword that was used to lingchi them had been Xiao XingChen’s sword, Shuanghua. Nothing was found. He either didn’t die, or his soul had dissolved. As a someone who specialized in the area, Wei WuXian had to comment on the matter, “Things like soul-summoning, you can’t rely on them too much. Time, place, and person all play a part in it, so of course it’d sometimes go wrong. I’m guessing that a lot of people think that it was Xiao XingChen’s revenge? HanGuang-Jun, what about you? What do you think? He poured a bowl for Lan WangJi. Without any thought, Lan WangJi took it over and drank up. Wei WuXian was unusually excited, staring at his face to see when it would turn red. Yet, even after he stared for a while, neither Lan WangJi’s face color or expression changed, staring at him calmly with light-colored eyes. There wasn’t any change at all! Wei WuXian was extremely disappointed. As he was about to urge him for another jar, suddenly, Lan WangJi frowned and lightly rubbed at between his brows. After a few moments, with a hand supporting his forehead, he closed his eyes. After most people drank so much liquor, they should become drunk first, and then sleep. How could Lan WangJi skip the step of getting drunk and go to sleep immediately?! “Drunken” was the part that he wanted to see! Wei WuXian waved at Lan WangJi, whose face remained serious even after he was asleep, then clapped beside his ears. There was no reaction. Lan WangJi was surprisingly the type who collapses after just one bowl. Wei WuXian didn’t expect this sort of situation to happen at all. Thinking as he shook his legs, he put Lan WangJi’s right arm around his arm, and dragged him out of the liquor shop. He had already familiarized himself with the action of fishing things from Lan WangJi. After taking out the pouch containing money, he found an inn and asked for two rooms. He carried Lan WangJi to one of the rooms, took off his boots, tucked him in, and slipped into the night. Stopping at a desolated area, Wei WuXian took out his flute by his waist, placed it by his lips, and played a melody. After this, he waited silently. In these past few days, Wei WuXian and Lan WangJi spent their days and nights together. He didn’t have any alone time, so he couldn’t summon Wen Ning. Aside from hiding his identity in the beginning, there was another reason. Wen Ning had killed the GusuLan Sect’s people before. Even if Lan WangJi treated Wei WuXian well, he couldn’t summon Wen Ning right in front of him. Or, perhaps, it was because Lan WangJi treated him well that he didn’t have the face to summon Wen Ning in front of him. No matter how thick his face was, this wasn’t the time to have a thick face. Before he knew it, the eerie jingling noises sounded again. With his head lowered, Wen Ning’s figure appeared from the shadows of the city wall ahead. He wore all black, melting into the darkness surrounding him. Only his pupil-less eyes were a glaring, hideous white. Wei WuXian put his hands behind him and slowly paced around Wen Ning. He complied and stopped moving. It seemed as if his delicate features appeared even more dejected. Wen Ning extended his right arm. Wei WuXian grabbed his wrist and lifted it up, closely examining the iron cuff and chain locked onto it. This wasn’t an ordinary chain. When Wen Ning flipped out, he became extremely violent, capable of twisting iron into sludge, so he wouldn’t have let it drag around like this. It was likely that this was a set of chains created especially to restrain Wen Ning. Trying as hard as they could to restore a damaged piece of Stygian Tiger Seal, of course some sects salivated at the Ghost General as well. How would they have been willing to turn him to ashes? 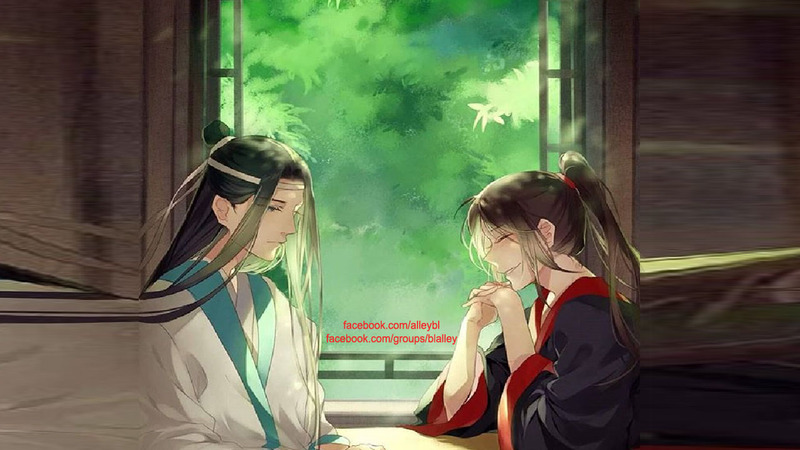 With a bitter laugh, he stood by Wen Ning’s side. After considering for a moment, he started to press his fingers into Wen Ning’s hair. The person who kept and restrained Wen Ning must have prevented him from thinking on his own. To make him listen to other people’s orders, Wen Ning’s sanity must have been destroyed, which meant that they must’ve planted something inside his head. As he had expected, after pushing around a few times, Wei WuXian found a hard nib on an acupoint of the right side of his head. He put his other hand on the left side of Wen Ning’s head and found the same thing, resembling the end of a needle. Wei WuXian pinched both needle ends at the same time and gradually pulled two black, long nails from within Wen Ning’s skull. The two nails buried deep inside of Wen Ning were around an inch long and as thick as the red strings used for jade pendants. As soon as the nails left his head, Wen Ning’s features quivered faintly. A layer of black lines that resembled strands of blood climbed across the whites of Wen Ning’s eyes. It seemed as if he was trying hard to endure the pain. How strange was it that, although he had died, he could still experience feelings of “pain”. Judging from the intricate, complex lines carved onto the nails, it must have came from a unique source. Their creator was fairly skilled. It’d take quite some time for Wen Ning to heal completely. Putting them away, Wei WuXian looked down at the chains on Wen Ning’s wrists and ankles, thinking to himself that it’d be a bit inconvenient for them to hang around and make noise. He’d need to use a cultivational sword to cut them off. The first that he thought of was, of course, Lan WangJi’s Bichen. Although it somewhat unbefitting to use the sword of someone from the Lan Sect to cut off Wen Ning’s chains, it was the best cultivational sword that he could get his hands on. He really couldn’t let Wen Ning drag so many burdensome things behind him. Wei WuXian thought to himself, Okay. I’ll go back to the inn first. If Lan Zhan is awake, then I won’t do anything. If Lan Zhan is still asleep, I’ll quickly borrow Bichen for a while. Having made his decision, he turned around. However, what he didn’t expect was that Lan WangJi was standing right behind him. Tiger Seal: A tiger seal is a seal shaped like a tiger, traditionally used when commanding troops, with one half in the emperor’s hands and the other in the general’s. Only when both of them are put together can the general command the troops. Daozhang: This is an honorific used to address Daoist priests or simply cultivators in general. The character dao means “path”, the same character from the word Daoist, while zhang means “leader”. Interesting fact: Daozhang sounds best when the seme is younger than the uke, in which case, Xue Yang just so happens to be. This was one of the first reasons why a lot of people started to ship the two. ZiChen: Song Lan is his birth name (which was what Xiao XingChen called him by—they were close), while Song ZiChen is his common name. Don’t worry. I know that you’re all thinking “it can’t possibly get any more complicated”, but it does. Luckily, there’s a character and sect guide to prevent memory loss! As the evil person I am, I refuse to provide the link because I think you should exercise your brains in preparation for what happens later in the story. Angry/sad because it’s inconvenient? You should exercise your hearts too, since I’m not sure if you can handle what’s about to come. Pailou: A pailou is simply Chinese-style archway. Since “links don’t work”, search it up on Google 😉 Don’t worry, I believe in you. Hand seal: Yes. Pretty much those things in Naruto (wait, you thought they were from Japan?). The hand seal, in this case, is used to command the gravedigger’s sword.